Few things bug me more than a poorly tied necktie. Even the nicest designer suit, shirt, and tie combination can look wrong with a badly tied knot. 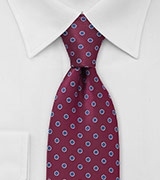 One of the worst fashion eye sores, in my opinion, is a tie that has been tied either too long or too short – something that can be tricky for men that fall outside of the 5’4″ – 6’2″ height range. Below I put together 10 tips short men can use to tie a necktie to the right length – so that the tip ends near your belt buckle. 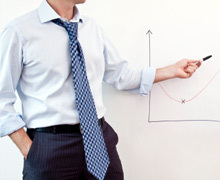 #1 Buy Certain Brands: Some designers are known for making ties that are a bit shorter than the average. Some excellent brands I suggest are: Feragamo (55″-57″), Paul Stuart (about 55″), and Ralph Lauren (54″-55″). These three brands are about 2-3 inches shorter than the average men’s tie and will be perfect for any man shorter than 5 foot 10 inches. 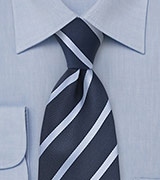 #2 Tie a Larger Knot: Larger tie knots take up more of the tie’s length. 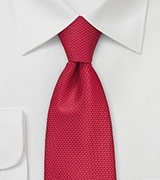 I suggest the Windsor knot – symmetrical and larger tie knot that is actually the most popular knot among US tie wearers. 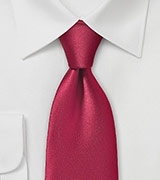 #3 Custom Tailored Ties: Yes, there is an option to get a tie custom tailored. A good place I have found is TieCrafters.com. Unfortunately there are some design limitations. #4 Add a Tie Bar: Accessorize your necktie with a tie bar – a metal clasp that slides over the necktie and prevents the tie from dangling. 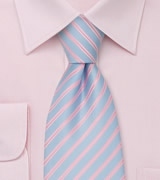 Simply slide the tie bar over the necktie and pull up the narrow end so that it hides behind the broad end of the tie. I personally am a big fan of tie bars, and I found this accessory especially suited for skinny ties. #5 3-Piece Suits: I am a huge fan of 3-piece suits. They are elegant, classy, and sophisticated! 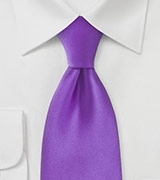 Also, they work well for ties that are too long as only the top 1/3 of the tie will be visible. 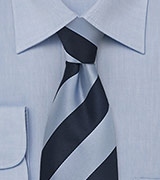 #6 Hide the Narrow End: If the narrow end of the tie is hanging lower then the wide end, then you can tug it in between two buttons of your dress shirt. I have tried it and it does work. The downside: It can be slightly uncomfortable. Also, if you choose this option I suggest you wear an undershirt that prevents the tie from touching your skin because perspiration can damage the delicate silk of your tie. #7 Scissors: Yes, cutting an inch or two off the narrow end is an option. I only recommend this if none of the six suggestions above worked for you. If you do decide to cut some of the tie off then please stitch up the cut to prevent fraying. I suggest you have your tailor do this for you. Dear visitor, if this is not your first time visiting my site then you may have noticed quite a few changes over the past two months. On the one hand I have updated the look of the site to make it a little more suited for the 21st century. I wanted a look that is contemporary but at the same time does not take away from the simplicity that so many of you liked about the previous site design. I have also added some new information lately such as a dress code guide on Black Tie attire. This blog section is also new and I am planning on blogging weekly about the latest tie trend, celebrity fashion, tips & tricks to match your tie, new ways to tie a tie, and much more. Lot’s of changes have already taken place and I am planning on further expanding this site. In the next 90 days I will continue to grow the dress code section with information on formal White Tie, casual Semi Formal Dress, and more. 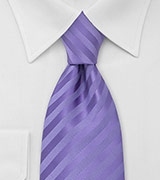 I will also add a few new ways to tie a tie, as well as will add a new section teaching you to fold a pocket square. It is my plan to offer useful information that is easy quick to read and easy to find. Should you have any suggestions then I would love to hear from you! Thank you again for your visit and support.